Our Top 7 Investing Magazines Review Helps You Find the Best Print Stock Market Journals & newspapers to Help Improve Your Investing & Trading. Before reading this article you need to decide if you are a trader or an investor because the needs of both are different. What does an Investor need from a Magazine or Journal? As an investor, you want new insight and thought-provoking analysis & research that will inspire you to make your next big long-term investment. News and articles that introduce you to new trends, services, and industries. What does a Trader need from a Magazine or Journal? As a trader, you need insight into new and existing trading systems and indicators. You might want systems for Forex Currencies or Commodities and Futures. You might also want to improve your own system development and build knowledge on backtesting. I have been a subscriber to Technical Analysis of Stocks & Commodities Magazine (TASC) for the last 8 years. It is essentially the Go To Managzine for experienced Technical Analysts. The magazine is very well written and has a host of high profile contributors. I myself have been published in TASC, with my Side-Stepping the Next Crash” article. The magazine covers the Technical Analysis of everything, Stocks, Options, Commodities, Bonds, Precious Metals and Foreign Exchange. It includes extremely helpful learning articles, such as how to develop indicators and new ways to analyze the markets. They also have a spotlight on learning new techniques for beginners and intermediate traders. TASC also touches on the current market climate with in-depth technical analysis of the various markets. The contributors provide systems designed to help you get an edge in the markets whilst also covering trading systems. Also often when a system is provided there will be the code for the various Technical Analysis Packages such as MetaStock or TC2000 so you can implement your own indicators and systems. As a subscriber, you also get access to the entire back catalog digitally, which is a pure goldmine of knowledge not available anywhere else on the planet. TIP – Go for at least a 1 Year Subscription to get access to the entire digital library. Bloomberg is one of the powerhouses of financial investing news services, catering primarily to Wall Street and Institutions, many of which pay a lot of money for the real-time feeds and the core market intelligence the Bloomberg Terminals bring. Most of us will know Bloomberg from the Bloomberg TV stream which is broadcast in most developed countries and available over the internet. It is a resource-rich multimedia experience and contains mostly high-quality reporting debate and opinion. Nearly every CEO on the planet at earnings time with show up to the Bloomberg studios for an interview. Business Week covers business, technology, finance, and economics. The focus on original content and insight is the key to the magazine. The Wall Street Journal Website offers a huge array of news and as you can guess it is primarily financial news. None of the news professes to be real-time or streaming news, but the website is full of thought-provoking opinion and some insightful journalism. The WSJ Markets part of the website has stock market specific news and statistics including stock screeners and portfolio tracking tools. The overall service has a paywall, which means after some browsing you will have limited access to the articles so you will need to subscribe. Wall Street Journal pricing comes in at a reasonable $21.50 per month for the print edition which is delivered once per week, $19.50 for the Digital only edition and Print & Digital for $22.50 per month. With the Digital version, you also get access to all the Apps, Podcasts and exclusive interviews. There is also a premium benefits program that enables you to attend various events and seminars. 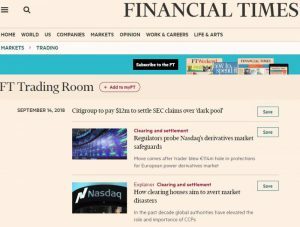 The Financial Times is one of the oldest financial print news organizations in the world, and it has done a good job with the look and feel of the website and they have a lot of in-depth data and financial content to offer. Most of it, however, is behind a paywall and it will cost you around $20 or 20 EUR per week. For that investment, you will get the Financial Times delivered to your home 6 days per week from Monday to Saturday plus their FT weekend paper and a digital version of the paper. The FT is a large newspaper with masses of content every day, so if you are willing to save a forest full of trees you can opt for the Digital Daily for $6 per week or the Digital Daily Plus subscription for $10 per week, saving trees and money. Forbes magazine is famous for its Forbes Rich List, but despite that is has a lot of thoroughly engaging original content. It does not just focus on money and investing it is more a business and lifestyle magazine. Its main product is Forbes Magazine which is available worldwide and the subscription. Prices vary but it will set you back around $100 for 12 issues per year. The website content is free and they have a whole host of contributors, but as we know free means plenty of advertising, but the content is good and the advertising is not overbearing. 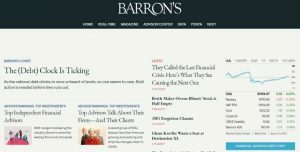 Barrons is another of the Dow Jones Family of products, its market niche is the fact the magazine focuses only on periodicals covering investing & retirement topics from the Dow Jones Network. The Barron business model is directed towards print, but there are also some digital offerings to be had with the digital pass. Non-US residents get the option of digital only. In the image to the right, you can see there is a tab called Real-Time if you click the tab you get recent news, but you have to keep hitting refresh to see if there are any more updates. Also, there are articles shared across the Down Jones Network, so you will see some Wall Street Journal articles added to the list. 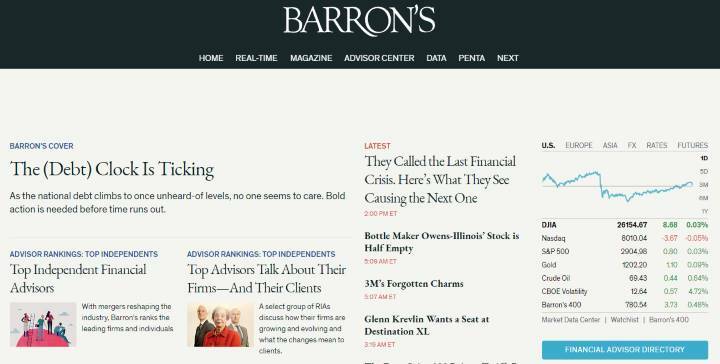 Barrons provides some great periodicals covering IRA’s, retirement or index or ETF purchasing, so good for advisors also. Investors Business Daily have been strongly driving their business to digital first over the past year. But they do still provide a print magazine service. IBD Weekly is available as a digital and print subscription. They provide a lot of their own research on stocks and use the famous CANSLIM method to evaluate the potential recommendations. They also provide various stock lists as extra subscriptions. Expect the magazine to heavily promote their online subscription and recommendations services.